A common theme amongst Sydney cyclists is that the cycle paths are terrible. Well that is certainly true in middle suburbs like Punchbowl and Greenacre and much of the North Shore but its not the case as you head into the newer suburbs in the far west. Great small examples out west are Potts Hill and The Ponds and really big examples are Old Windsor Rd, the M7 Cycleway and around Narellan. Narellan you say ! That was where I just rode and it’s a good place to just cruise on shared paths for a long way. 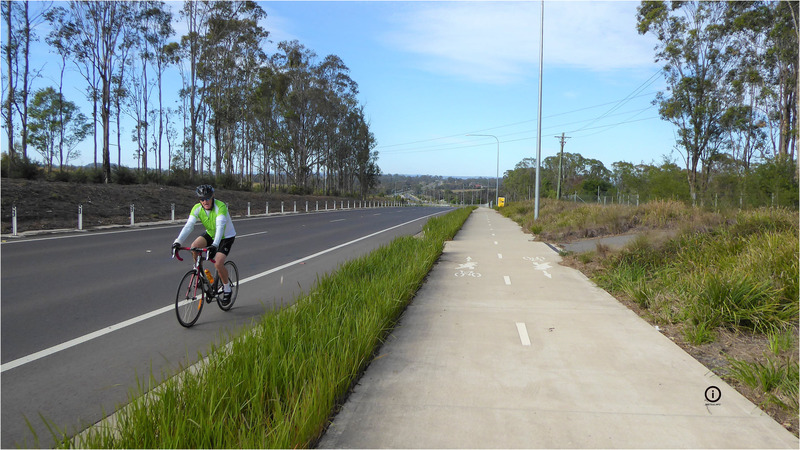 I started at the M7 Cycleway near Prestons and followed the shared path all the way to Narellan along the Camden Valley Way. There it took me a little while to realise I needed to be on the south side of Narellan Rd and then it was shared path except for 500m all the way to Macarthur Station where I boarded the train back to Glenfield. This was 30kms of riding and an easy trip on the train. This ride has some hills and a few well managed road crossings. 30km if you go to Glenfield. Not the most exciting path but the ability to constantly ride and see some new suburbs makes it worth a visit. There are a few service stations along the way and Mt Annan and some “new suburb pond rides” are worthwhile side trips. Check out the photos, the trail looks like the few I have posted all the way.